You know when you try a new recipe and it’s so good that you know you’re going to have to make it again…and again…and again! Hello! 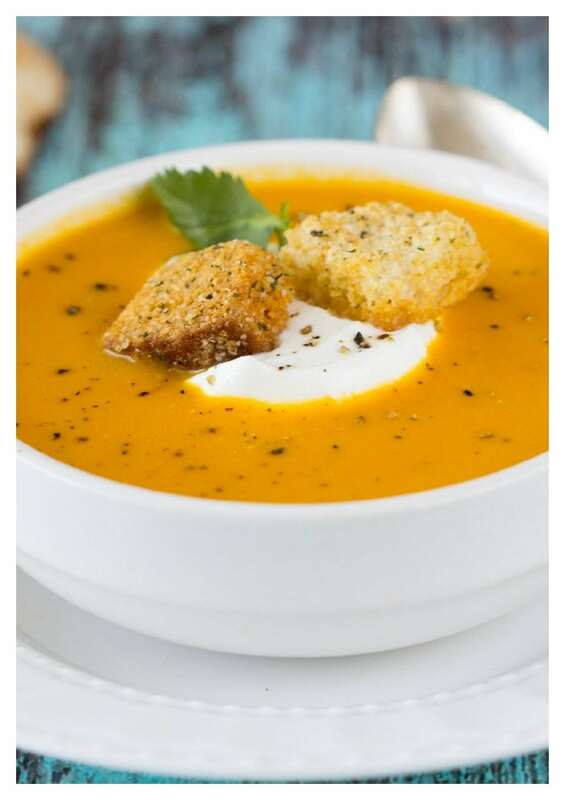 …Curried Coconut Carrot soup I’m talking about you! Those 3 C’s (Coconut + Curry + Carrots) are some of my favorite things so when they are all swirling about in a wonderfully flavorful and easy to make soup what’s not to love? Soup is such a versatile meal option. I like that you cook up one big batch and it seems to just get better with each bowl. Somehow all the flavors seem to just intensify and mingle and soup on day 2 and day 3 tastes particularly delicious. I even like to just pour (or ladle) a little soup into a coffee mug and zap it in the microwave for a quick snack or light meal. Since I posted the recipe for Creamy Cauliflower and Cheddar soup a few months ago ( oh look at that…ha ha…more C’s! Creamy + Cauliflower +Cheddar) it’s been my “go-to” for quick, easy, nutritious soup. 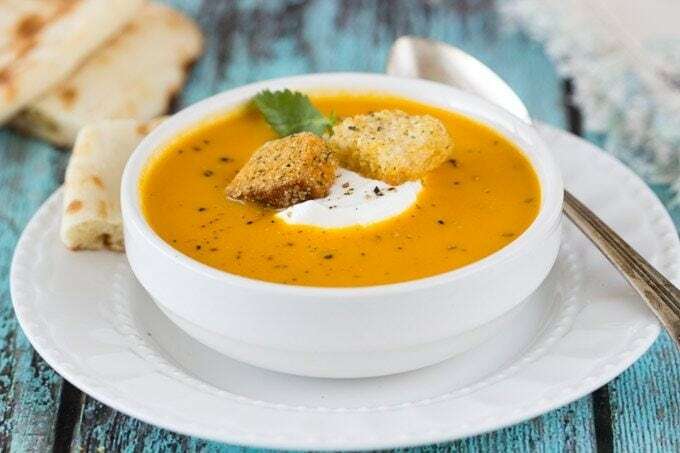 For all the reasons I love that soup 1) simple to make 2) chock full of veggies 3) creamy texture 4) super flavorful are all the reasons this Curried Carrot Coconut Soup may just become my new” go-to”. This recipe calls for 1 lb. of peeled and chopped carrots. If you want to keep things super simple you can use a bag of already peeled baby carrots. The coconut flavor comes from coconut milk, which is what gives this soup its luxurious creamy texture. The curry flavor comes from yellow curry paste which you should be able to find in well stocked grocery stores or any Asian market. It’s worth the effort to source out the yellow curry paste because the paste is actually a mixture of curry plus other flavors like lemongrass, kaffir lime, cumin, cinnamon, cardamom, clove, shallots, and fennel to name a few. If it’s not possible to find, you can substitute curry powder. The recipe calls for a pinch of cayenne which I used in the first batch I made. I found that the curry paste had enough heat for me and so the future batches I’ve made I’ve omitted the cayenne. Curry pastes will very in their flavors so you may want to make without the cayenne , taste and then add the cayenne if you want more heat. You won’t have to spend all day slaving over the stove, this soup is ridiculously easy. Add all the ingredients to a pot and let the veggies cook (about 12 min.) let soup cool a few minutes and then puree in a blender. That’s it! Voila…soup’s on! 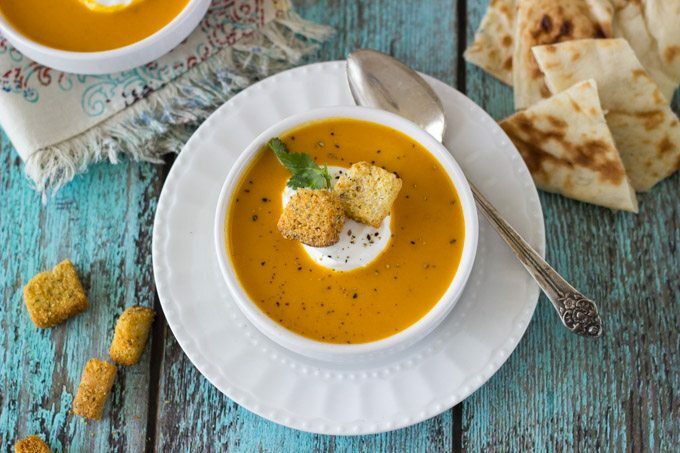 Serve with a dollop of cool Greek yogurt and a piece or two of warm Naan bread (perfect for dipping into soup and using to “mop” up every last drop of soup). Heat olive oil in a large saucepan over medium-high heat. Add onion and garlic and cook 3-5 min. until onion is translucent. Add curry paste, cayenne and cook an additional minute. Add carrots and chicken broth and continue to cook until carrots are tender (approx. 10-12 min). Turn off heat and let soup cool slightly. Puree soup in a blender, working in batches. Add back to saucepan and stir in coconut milk. Heat until hot. Serve soup in bowls and top with a dollop of yogurt, chopped cilantro, and fresh pepper. I just made this. It is absolutely delicious. So smooth and creamy. I didn’t have yellow curry paste so I used red curry paste which I had already. And I also omitted the cayenne. I also put in some grated ginger. Yummy. I have tried the curried Kale and Chickpea soup, the curried carrot soup and the cauliflower soup. They all three rock. Do you have a tomato soup? Mushroom soup? etc. Thanks! @ Mary Kay….will come up with something and post soon! thanks for your feedback.